Faced with difficult year-over-year comparisons, Valspar posted double-digit sales declines in both its Paints and Coatings segments for the first quarter of fiscal 2016. “The results in the first quarter were in line with our expectations,” said Gary E. Hendrickson, chairman and CEO of the Minneapolis-based company. Overall, net sales in Valspar’s first quarter declined over the prior-year period by 13 percent to $885.8 million, the company reported Thursday (Feb. 18). The company posted earnings of $52.4 million, down from $104 million in the same period a year ago. Gary E. Hendrickson, Valspar's chairman and CEO, has reaffirmed the company's guidance for fiscal 2016. Total volumes dipped 8 percent, driven by change at Lowe’s and difficult comparisons to exceptional performance in the previous year. However, “[w]e expect to benefit from improved productivity and easing year-over-year comparisons in the balance of the fiscal year,” Hendrickson said, reaffirming the company’s fiscal 2016 outlook. Hendrickson noted that new business wins in many of Valspar product lines and strong earnings before interest and taxes growth in its Coatings segment were the highlights of the quarter. “Our Coatings segment is well positioned for growth, with a robust pipeline of new business and a strong product portfolio, enhanced by the recent acquisition of ISVA Vernici, a European coil coatings manufacturer,” he said. Hendrickson also noted that the introduction of Cabot stain at Lowe’s was a win for its Paints segment. Net sales in Valspar’s Coatings segment decreased 10 percent to $544 million. This includes the effects of foreign currency translation that negatively impacted net sales by 6 percent, Valspar reported. 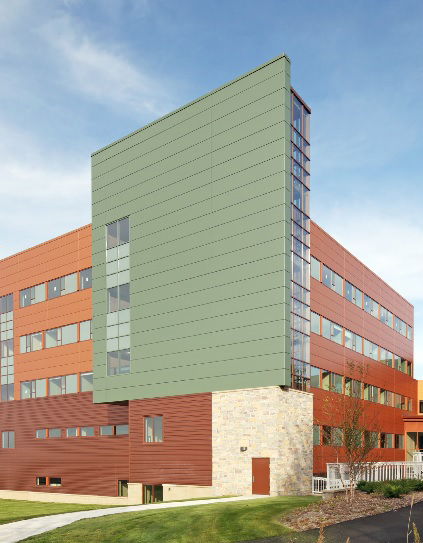 Valspar's coatings portfolio includes coil and extrusion products for high-performance architectural applications. Volumes decreased 3 percent in the first quarter, compared to growth of 10 percent in first quarter of 2015. The Coatings segment adjusted EBIT of $97 million increased 6 percent, as the benefits from productivity initiatives and cost/price more than offset the decline in sales and the impact of currency translation, the company said. Adjusted EBIT as a percent of net sales increased to 17.8 percent from 15.1 percent in the prior year. First-quarter net sales in the company’s Paints segment decreased 20 percent to $291 million. Foreign currency translation negatively impacted net sales by 5 percent, the company said. Volumes were also down 20 percent in the first quarter. Valspar laid the losses to the following: the expected impact from the shift at Lowe’s; temporary actions taken by customers to lower inventory; and difficult comparisons to the strong volume growth from the international businesses in the prior year. Acquisitions added 9 percent to net sales and 4 percent to volume in the quarter. Paints segment adjusted EBIT of $4.5 million declined 84 percent, driven by lower sales and the impact of currency translation, partially offset by positive benefits from productivity initiatives, cost/price and the Quest acquisition, Valspar reported. Adjusted EBIT as a percent of net sales declined to 1.5 percent from 7.9 percent in the prior year. The company’s guidance for fiscal 2016 includes sales growth in the “mid-single digits” in constant currency. Reported sales, including the estimated impact of foreign currency translation, is expected to be “up slightly” compared to fiscal 2015, the company said. Adjusted diluted earnings per share are expected to be in the $4.80 to $5.00 range, Valspar reported.